Mario is a postdoctoral research fellow at the Institute for Sustainable Industries and Liveable Cities (ISILC). He received his PhD in Sociology, Political Science and Islamic Studies from the University of Melbourne for his comparative study on Muslims’ civic and political participation in Australia and Germany. He has been working as a social researcher, both in Europe and Australia, since 2003 on issues related to exclusion-inclusion, multiculturalism, racism, participation and citizenship. Mario has also contributed to consultations with various national and international agencies, including the United Nations Special Rapporteur on Racism, the Council of Europe, the Organization for Security and Co-operation in Europe (OSCE), the Australian Commission for Human Rights and the Victorian State government. Mario is particularly interested in ethno-religious community dynamics in the context of active citizenship. 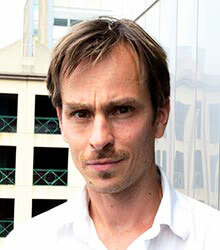 His current research projects examine, among others, the activism of right-wing movement in Victoria and the civic engagement of Muslims in Islamic organisations. Peucker, M. & Ceylan, R. (eds) (2017) Muslim Community Organizations in the West. History, Developments and Future Perspectives. Wiesbaden: Springer. Peucker, M. (2016), Muslim citizenship in liberal democracies: Civic and political participation in the West. Basingstoke: Palgrave Macmillan. Peucker, M. & Akbarzadeh, S. (2014), Muslim active citizenship in the West. London: Routledge. Peucker, M. (2019) Islamophobia and Stigmatising Discourses: A Driving Force for Muslim Active Citizenship? In Esposito J. & Iner D. (eds) Islamophobia and Radicalization. Cham: Palgrave Macmillan, pp. 245-264. Peucker, M. & Akbarzadeh, S. (2014), Managing religious diversity and promoting active citizenship: Muslims in Australia, Britain and Germany. In Mansouri, F. &, Boulou, E. (eds) Global Perspectives on the Politics of Multiculturalism in the 21st Century. A case study analysis. London/New York: Routledge, pp. 141-160. Peucker, M. & Akbarzadeh, S. (2012), The vicious cycle of stereotyping: Muslims in Europe and Australia. In Mansouri, F. & Marotta, V. (eds.) Muslims in the West and the Challenges of Belonging. Melbourne, Melbourne University Press, pp. 171 – 197. Peucker, M. (2018), On the (In)compatibility of Islamic Religiosity and Citizenship in Western Democracies: The Role of Religion for Muslims’ Civic and Political Engagement, Politics and Religion, DOI: 10.1017/S1755048317000700. Peucker, M. & Ceylan, R. (2016), Muslim Community Organizations - Sites of Active Citizenship or Self-segregation?, Ethnic and Racial Studies, vol. 40, no.14, pp. 2405-2425. Peucker, M., Roose, J. M. & Akbarzadeh, S. (2014), Muslim active citizenship in Australia: Socioeconomic challenges and the emergence of a Muslim elite, Australian Journal of Political Science, vol. 49, no.2, pp. 282-299. Peucker, M. (2011), Educational approaches to reduce prejudice – a core element of human rights education in pluralistic societies, Education and Society, vol. 29, no. 2/3, pp. 57-80. Peucker, M. (2008), Similar procedures, divergent function: Citizenship tests in the United States, Canada, Netherlands and United Kingdom, International Journal on Multicultural Societies, vol. 10, no.2, pp. 240-261. Mario Peucker (2018), Muslim Community Volunteering: An Underestimated Contribution to Social Cohesion? ABC Religion & Ethics, 17 May. Mario Peucker (2018), On Islam’s compatibility with liberal democratic principles, Religion in Public, 27 April. Mario Peucker and Scott Stephens (2017), Citizenship, Dissent and Political Disagreement: An Exchange (external link) ABC Religion and Ethics, 4 May. Mario Peucker (2017), Muslim Community Organisations: Threatening or Promoting Social Cohesion? ABC Religion and Ethics, 2 February. Mario Peucker and Debra Smith (2016), Anti-Muslim agenda in media and rallies drags discourse to the political right, The Age, 13 June. Mario Peucker (2015), Muslims 'Radicalised' into Active Citizenship: The Untold Story, ABC Religion and Ethics, 21 December. Mario Peucker (2015), We are not going to sit on the periphery. How Australian Muslims enact their citizenship, The Conversation, 16 October. Mario Peucker (CI), Australia-Germany Joint Research Cooperation Scheme (University Australia-DAAD), Muslim community youth work aimed at countering and preventing radicalisation to violence in Germany and Australia, together with The University of Osnabrück (Germany), $11,400, 2016-2018. Mario Peucker (CI), Michele Grossman (CI) and Debra Smith (AI), together with Hass Dellal (CI, Australian Multicultural Foundation), Stocktake Research Project, Social Cohesion and Community Resilience Ministerial Taskforce, Department of Premier and Cabinet, Victoria, $49,000, 2015-2016.